When editing a post, the tag excerpt tooltips (that you get when viewing a post) are not available. 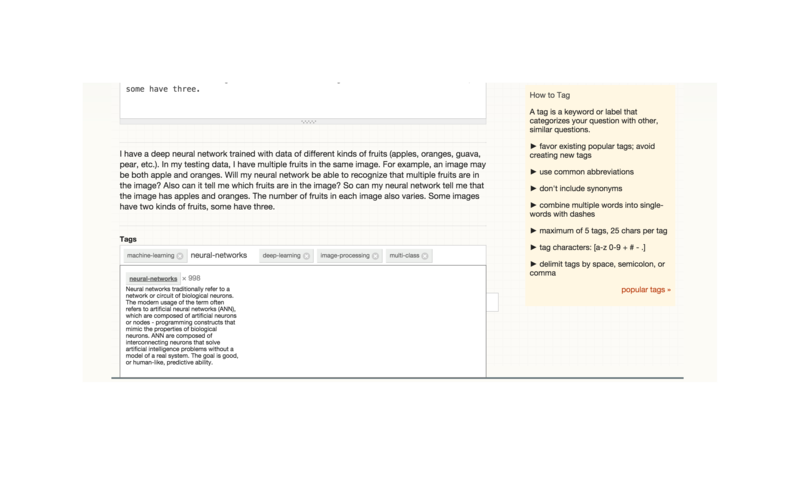 You do get the live tag preview (that you get when asking a question) for any new tags you add, but sometimes you want to check the tag wiki for the existing tags to make sure they are correct. As it stands you have to remove the suspect tag and re-add it to see the tag info. As of February 2014, the below is no longer true. Tags are removed from the sidebar in question view. However, it would be nice to have it back when editing, if only for the tag excerpts. However this would be nice to have for newly added tags as well, which don't appear there. Since users without edit privilege are redirected to a different page to suggest the edit, the tags are indeed "lost" and this request becomes even more important. Unfortunately the workaround presented by Shadow Wizard stopped working when they stopped displaying tags on the right side earlier this year. When editing, delete a tag then re-add it by re-typing it. The wiki excerpts will display. When editing, scroll alllllll the way to the bottom of the page and mouse over the tags in the "Browse other questions tagged ..." blurb. I prefer the first since I do not have to scroll away from the editor. Both are fairly poor UX. 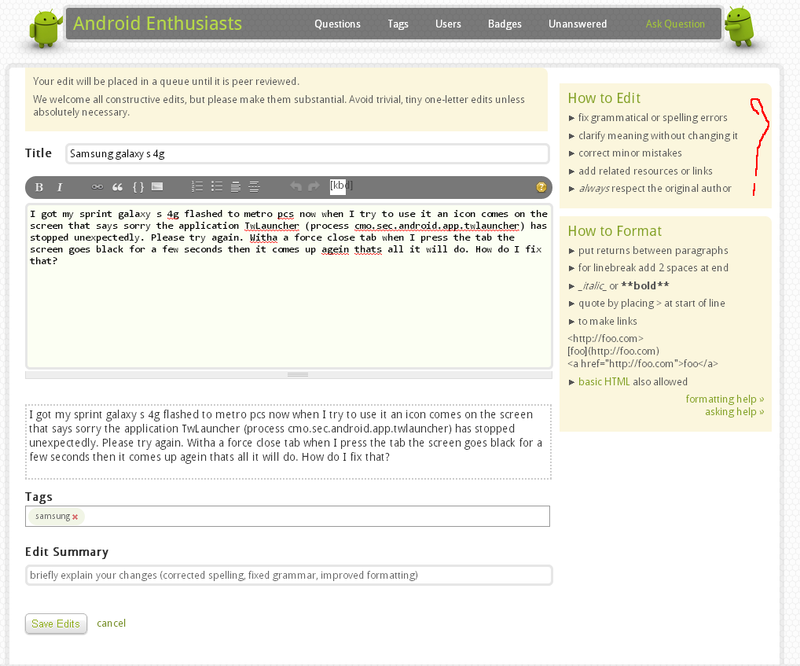 My suggestion is to display the tag info box when hovering the mouse over the tags in the "Tags" field of the editor. I just borrowed the code from SE's JS, and edited a little to make it work while editing. I also posted this on StackApps. I just asked this question myself (was duped and is what lead me here). If you then click elsewhere on the tag bar it turns from text to a tag again. This works ok, and am glad of the info, but it is only a workaround and not a good UI function. I don't need to untag, I need to see excerpt to decide if to untag. I also don't need all "similar" tags which this workaround shows as it brings up the selection box. That is different, and is there for other specific reasons and uses. Workarounds are not specifically designed, so we end up with adverse effects. Or we lose them, as using things they were not designed for is not considered in site changes (like the workaround in ShadowWizard's answer). It was stated there is no reason for this not to be implemented, so just wondering if there is any update to when this might be done? I know your folks are always busy, and this might be low down on your list still. But, while it can be argued this missing functionality is no big issue, making sure questions have the right tags is important, and the proposed functionality would make that easier, quicker, and less "hacky". Seems like the feature of displaying tags on the right is no longer present. However, I have found a temporary solution, which might help address the problem for the time being. This is a very common problem, and displaying tag excerpts would really help people while editing questions, for tagging and untagging relevant tags. Not the answer you're looking for? 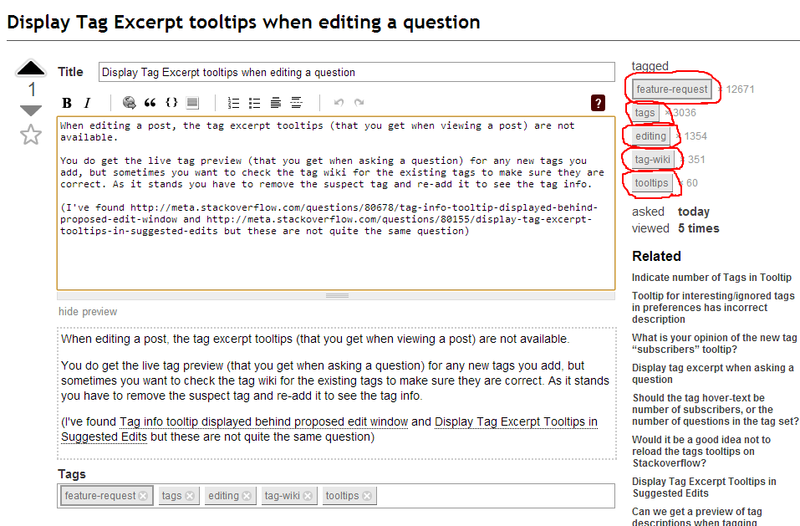 Browse other questions tagged feature-request status-deferred tags edits tooltips .